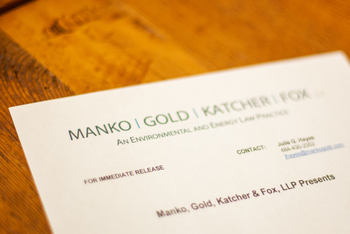 Philadelphia, PA (July 19, 2010) – Manko, Gold, Katcher & Fox, LLP (MGKF), the environmental, energy and land use law firm based in Bala Cynwyd, PA, is pleased to announce that Suzanne Schiller joined the firm as a litigation partner effective July 1. Schiller most recently served as a member of Specter Gadon & Rosen, P.C. 's Commercial Litigation Group with a concentration in the practice areas of real estate and complex civil litigation. She has successfully represented Fortune 100 companies, leading shopping center owners, commercial real estate developers, municipalities, and others. A member of the International Council of Shopping Centers, Schiller frequently speaks at industry trade conferences and regularly authors on real estate issues for industry publications.